What if you’ve always coveted a Lamborghini, but can’t stand the idea of owning one? Those V10 and V12 engines aren’t very environmentally friendly, and driving a car that’s about as wide as a Chevy Suburban, but with the outward visibility of a Cold War bunker, down city streets doesn’t sound like fun. Luckily, Lamborghini has a solution. Sort of. The latest Lamborghini is compact, lightweight, and easy to park. It’s also a bicycle. The BMC Lamborghini 50th Anniversary Edition Impec is the latest special edition “model” to celebrate the Italian carmaker’s 50 years in the business. It’s a bit of a letdown from the 750 horsepower Veneno Lambo unveiled at the Geneva Motor Show, but the bike does have some unique features. The Impec is largely made of carbon fiber, just like the Lamborghini Aventador. The seat and handlebars are also covered in the same leather you’ll find on an Aventador’s seats, and the bike is finished off in a suitably shout-y shade of yellow. 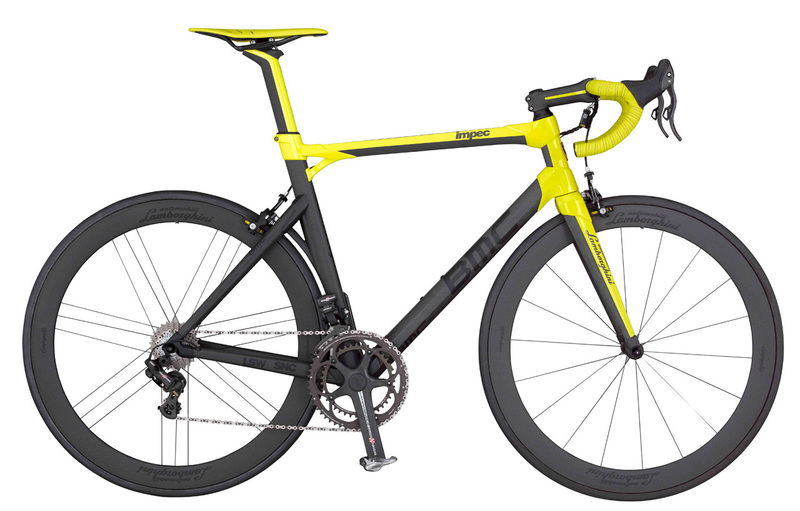 Lamborghini and BMC built a limited run of 30 Impecs last year, and it’s unclear what distinguishes the 50th Anniversary model from those bikes, other than the fact that it will be more common. Fifty bikes will be built this year, on a made-to-order basis. The two-wheeled Lamborghini will sell for 25,000 euros, or about $32,000. That’s the price of a well-equipped midsize sedan or crossover, but it’s chump change compared to the roughly $200,000 Lambo asks for a base Gallardo, or the $393,695 MSRP of an Aventador. The Impec might seem like a lame exercise in branding, but it really does embody some of Lamborghini’s core qualities: it attracts attention, it’s exclusive, and it’s impractical. You’ll need more than a bike lock to repel thieves from this carbon fiber marvel.